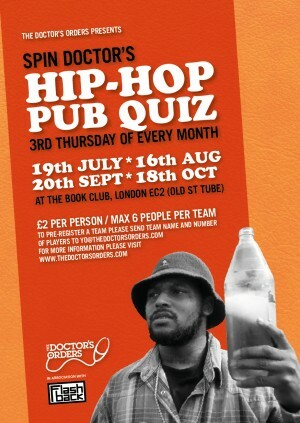 Get your team together and answer questions from all ages of rap about your favourite MC’s, DJs, producers, albums and more. It follows the tried and tested format with picture, film, music rounds and loads more! Designed to be fun for music fans no matter how much they may or may not know. The winning team from each round chooses one of our golden envelopes and the prize held within, while monthly winners win the coveted Hip-Hop Pub Quiz Championship belt as well as a bag of swag from our friends at Flashback Records and a bottle of bubbly so they can profile like the big boss money playaz they are. Each month the team to beat is Spin Doctor’s guest VIP team from inside the music world. Labels, promoters, DJs, radio stations, media groups and more come to show what they think they know but without the chance of prizes!